« Who are we? Who are you? Why do gas prices always end in 9/10 of a cent? ?We have to go way back, approximately 1930, to when the oil companies were selling gas for, let?s say, 15 cents, and then the state and federal boards decided they wanted a piece of that to keep the roads going, so they added 3/10 of a cent. And the oil companies said, ?Well, we?re not going to eat that,? so they passed that on to the public. They found out that if you priced your gas 1/10 of a cent below a break point, let?s say 40 cents a gallon, ‘.399’ just looked to the public like 39 cents? You won’t find tenths of a cent on your credit card bill. Or even on the pump. But if you buy 15 gallons of gas at $3.299, you?re paying 13 cents more than at just $3.29. 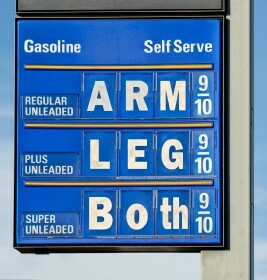 Since Americans buy 178 million gallons of gas a day, that?s a half-billion dollars more per year. These types of details and hidden fees are what eat at the bottom line of companies. At SafeSourcing, Inc.? we find and bring out these levels of details for our customers when doing analysis for running Request for Proposals and Request for Quotes. For more information on how we can help you with your procurement needs or on our ?Risk Free? trial program, please contact a SafeSourcing Customer Service Representative.? We have an entire customer services team waiting to assist you today.